Every hundredth citizen of Warsaw is originally from Vietnam. However, they are invisible in the city that is almost homogenic. The only place one can notice their existence is Vietnamese part of the Jarmark Europa Market. Students and educated people, quite often with their PhD, created this spot in early 90's so that they could work and at the same time were able to use the polish economic prosperity in order to become successful. 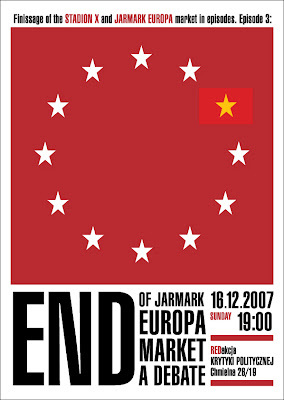 Lately, many questions have arisen because of the idea of closing down the Jarmark Europa Market: What will happen with Vietnamese people after that? Is it truth that they decide to return to their homeland, because of the polish political situation? What do we know about the Vietnamese minority - the biggest minority in Poland? During the debate a short movie about Vietnamese, who are back to Hanoi was presented and conversation between Ngo Van Tuong (activist and journalist), Teresa Halik, PhD (Vietnam specialist), Paweł Boski, PhD (psychologist) and Joanna Warsza (curator of the project) was held.